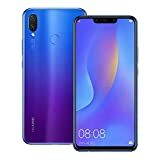 Huawei nova 3i is the latest Huawei Android phone with three different colors such as Black, Iris Purple, and Pearl White. The most famous color of this mobile is Iris Purple. The Screen of this mobile is 6.3-inch FHD+ (2340 x 1080) and front Dual AI cameras 24 MP + 2 MP and back 16 MP + 2 MP. Read out the full phone specifications of Huawei P Smart+ nova 3i.